We’re back from our month-long trip. We arrived Saturday and I’m slowly emerging from a fog of jetlag. In the last week, I was on planes 5 out of 7 days. Airports are crazy places. We’re so glad to be back and settling into the routine of being home. I have yet to unpack and do laundry and I have bear book revisions to do. I was in Columbus for 5 days of the trip at the Needle Arts Association trade show. One of the things I like about trade shows is seeing my designs “in the wild.” Lorna’s Laces had a version of Ribs and Mesh worked in their Shepherd Sport that was soft and stretchy and showed of the hand-dyed colors beautifully. In the Blue Sky Alpaca booth there was lots of buzz about the debut of their new yarn line Spud and Chloë. The yarn line is different from other blue sky yarns because all the yarns are washable. Two of the yarns Sweater and Bulky contain superwash wool and organic cotton. Late last year, I was asked to come up with a crochet design for the new yarn. 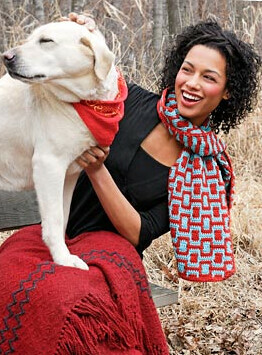 I chose to use the Sweater and I designed this scarf in Mosaic Crochet – a fun technique that creates color patterns using chains and spike stitches, but only working in one color per row (similar to mosaic or slip stitch knitting). In fact, the stitch pattern was adapted from a Barbara Walker knitting stitch. I love how the scarf turned out–on the one side, you have the color block pattern, and on the reverse you have textured stripes. In choosing the colors I wanted to make sure there was a good contrast so the pattern really pops. I usually love subtle color variations in colorwork, but I thought in this case bold choices worked better. The Spud and Chloë color palette has some great colors and I was sent a sample of each for swatching, I spent a lot of time, just rearranging skeins on the floor to come up with color combinations. The folks at Blue Sky have generously offered to give away a kit for the scarf (4 skeins of Sweater in the colors of your choice, and the pattern), to one reader of my blog. The yarn is so new that most stores don’t have it yet, so if you win you’ll be one of the first crocheters to try it out. To enter, just leave a comment on my blog about how you make color choices in your crochet. On July 1st (my birthday), I’ll pick a winner. Good luck!